Let’s not make things more difficult than they need to be. I like to break down traditional sewing methods into their simplest way to be accomplished. On this week’s Sewing With Nancy, I’ll show you my favorite techniques created in the absolute easiest ways. Watch part one of the three-part series on The Absolute Easiest Way to Sew. Starting with pattern layout, cutting, and marking, learn ways to streamline and improve your sewing skills. Do sewing darts have you in a dither? Learn how to use an index card or sticky notes as the sewing guide for effortless dart stitching, It’s the next Absolute Easiest technique. One size does not fit all when it comes to sewing gathers! Type of fabric, the width of the seam allowances, and the project dictate the absolute easiest way to add gathers to fabrics. I show you four options during this TV episode, plus there are more in the book, The Absolute Easiest Way to Sew. When adding elastic to knits, you’ll find this, by far, the simplest way to a sew casing. You’ll be stitching less and enjoying it more. 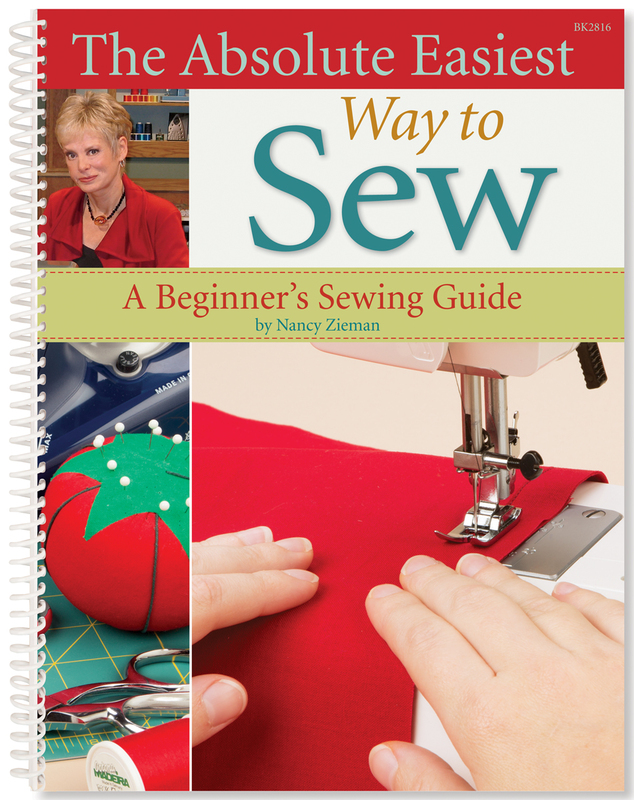 All my favorite sewing tips are in one book. 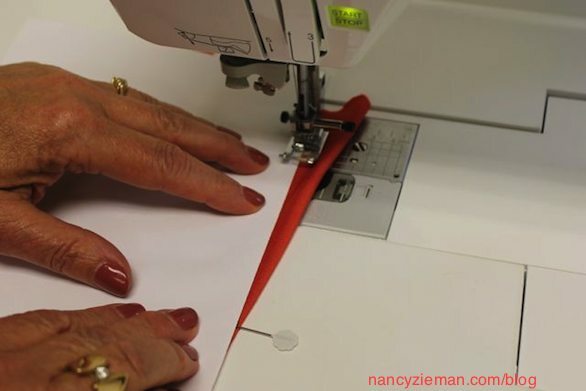 Watch The Absolute Easiest Way to Sew (Part One, Part Two and Part Three) on Sewing With Nancy online. This looks like a great book to have and a really cool tool to use for all my sewing projects! I would use it for way too many things to list. Nancy’s videos are great to view for sewing help. Back in the 80s and early 90s, I owned all your publications in several of those aqua-blue binders. (Remember those?) Sadly, all of my books and fabrics fell victim to a flood. I’ve started sewing again but my funds are limited so I’m trying to decide which of your books will give me the best bang-for-the-buck. This looks like a contender. I have several of your books. Combining the tips in one book is nice. I would love to see tips on working in a small space. Sizing for children is difficult for me, too. I want to try the elastic waistband in a skirt. I would like to know how to easily do a fly front, like on a pair of jeans! Thanks. I would love help with binding necklines… tanks and tee shirts for women. I watch you every Friday! I would love help with binding necklines… tanks and tee shirts for women. Watch you every Friday! I like the ideas about elastic, and could use ideas like that when sewing for my daughters. However the gathering techniques look like something fun to try….you make things so much easier! Thankyou, Nancy, I love learning from your tv shows, and am often inspired to try something new. I need to work on piping the most. Not just sewing pre-made piping around convex and concave corners, but also in making my own piping. What a wonderful book – all your years of knowledge in one place! I have my DVR set so I never miss an episode of your program. The technique I struggle most with is buttonholes… I never seem to get them right, so I end up avoiding them altogether! Thank you for all the ways you have inspired me to be a better sewist! I like the “no top stitching” elastic waist technique, but wonder if it can only be used with knit fabrics? Thanks for all the great tips. Both elastic with and with out casings is helpful as are some of the hemming hints, it seems if I buy pants I always have to hem them. Putting pockets into pants when the pattern doesn’t have them is an area where I could use help. Using your tip for sewing elastic in clothing will certainly make my sewing top help list. Help with zippers and installing them is also a big help for me. Next, diy button holes. I like the dart tip. No mote wavy stitching. Thank you! I am really interested in learning that method of sewing elastic. I have never been able to master that skill. Thanks for the giveaway. Sewing elastic is the tip I think I will use the most. Great tips. Thank you for all your help. I tune in often to find answers to my questions. I would love to learn more about texture techniques on a sewing machine. I have tried all of these methods and LOVE them. My favorite is probably the elastic waistband. I use it for [almost] all of my skirts. I love your way of gathering over fishing line or dental floss. I have used it many times when sewing costumes for our community theatre group. I’m always looking for short cuts for sewing costumes. Thanks so much for all your helpful tips. I love your tips on sewing knits especially about setting sleeves in the second video. The gathering method is great that you have taught. I tend to pull and break the threads and have to resew them. You make things look so easy! I would love to have your book with all the good pointers in it. I could sure use some time saving techniques as I have so many things I want to make! I can go in my sewing room on any day and have to choose on which one to work on today….I love to sew….It’s almost like a craving for me. I become sort of empty if I haven’t sewn for 3 days…. I love your elastic technique…..that’s the easiest way I’ve seen yet! I will be able to make skirts really fast! I am constantly learning things from you Nancy. You have been my teacher for many years and I would love to have your book! You have taught me so much. Thank you Nancy!! Like so many others—elastic. I have tried so many methods and none have been satisfactory and, after a couple of wears, the pants, etc., are very loose. I bought “The Absolute Easiest Way to Sew” for my two daughters and a granddaughter that have all taken up sewing. A great reference! Not.for the book,I want to thank you Nancy for these wonderful ,Free Programs you bring to us! God bless. You! The elastic tip will be helpful to me! Even though I have been sewing 50 plus years, there is always something new to learn. I am sure this book would be very handy. I would like to learn how to make elastic the correct size for the waist. I either make mine to small or too large . I like the trick with the index card for the darts. I personally enjoy making darts and pleats. Thank you Nancy for making tutorials for us and for a lovely TV show. Have a safe Memorial Day weekend. One of the frustrating problems that I face when sewing my own clothing is how to embellish them. I do not own an embroidery machine, I do hand embroider and also enjoy using beads and ribbons in my embroidery. Yet, I always feel awkward in knowing what embellishments would look good and enhance the clothing piece or even where/how to start. Thank you for sharing all of your Excellent tutorials and programs and all of your knowledge; they have helped me so much. Have a fantastic creative day! I need to learn how to make an elastic waistband. I don’t know if I add or take away inches to make it the right size. I love watching your show. Sadly I don’t have a TV so I don’t get to watch very often. Have a wonderful day and a safe Memorial Day weekend Nancy. I would like to learn how to determine size for kids clothes. My niece tends toward different, sort of “far out” designs. But I need to learn the basics. My forte is quilting so I need to back-step to basic sewing techniques and progress on from there. So a beginners guide is just what I need. I will be watching all 3 episodes this W/E when I have time to concentrate as today is a house cleaning day. Great offer. Sharing your talents has always warmed my heart. Lot’s of ideas in this great book. Would love to try them. The elastic for casing really excites me. Thanks so much for making this available. Definitely knits. I avoid them like the plague and have had to say no to friends asking me to hem knits. I really need lessons in sewing knits. The easy way to do a zipper would be useful. I know people who will not sew something that has a zipper in it! Elastic! working with it, getting it in the casing, getting it not to roll. Thank you for your tips for working with it. I am returning to sewing garments after many years and love all these tips! This series and the book will be very helpful to me. I have been doing hems for years, but I finally met a mountain of trouble hemming a pair of men’s trousers. Could Not get the machine hem to not show – even changed needle size to no avail. So after 1-1/2 hours, I had to resort to manually hemming. Fabric was some sort of synthetic with a slight stretch and shows even a picked hem. Do you have any tips. I didn’t see this kind of problem in this otherwise wonderful video. My fave has got to be the index card trick for sewing darts!!! I keep notes on index cards literally right by my machine and I never thought of doing this!! Sewing elastic to fabric is by far the technique I have the most trouble with. It seems I’m all thumbs! I love sewing items with intricate details like edge stitching. However, in sewing doll clothes it has become apparent that that I really need help know which elastics I can actually sew through and which must be in a casing. Stretch and sew often turns into stretch, sew, and stay stretchedout. Argh. I really appreciate the tips on making a casing with elastic. While a lot of tips I’ve picked up on my own over the years, I learned something new from the video: sewing the ends of elastic to a piece of woven fabric is my favorite. I do a lot of casings. I knew to baste the seams down, just by experience, but still struggled with sewing down the elastic after threading it through the casing. I already use pattern weights when laying out fabric, but didn’t think to fold the grain arrow and put a pin in that area. Thank you. I am just amazed at some of your “simple” tips that really make the sewing project go faster and make it a lot easier. Thanks for all you do. I need to learn any and all tips for working with elastic in a waistband. I like the tip for sewing elastic to knits the best. Shaela Forbes, this has helped me, first, get elastic unrolled, pull waist taut, pin on the sides and the middle of the back and front, then stitch vertically in the side seams and in the front and back. If they are worn w/a tucked in shirt just tack the inside front and back on the inside of the waistband. Hope that works for you! I would like help with machine and hand hemming. Tops, skirts,shorts and pants in all fabrics. When to use both methods. So far I can’t “get” sewing machine hemming pants, the folding confuses me! Please help! This sounds like a great book!! I learn so much from Nancy every time I watch one of her programs. Thanks for making them available to us.